Partners face each other directly, one skating forward while the other skates backwards. The man's right hand is placed firmly against his partner's back at her shoulder blade with the elbow raised and bent sufficiently to hold her close. The ladies' left hand is placed against the man's right shoulder with her arm resting comfortably on his, elbow to elbow. The man's left arm and ladies' right arm are extended at average shoulder height. The shoulders are parallel. Most commonly used for the beginning dances. Partners face in the same direction, lady at the right of the man, man's right shoulder behind ladies' left. Ladies' left arm is extended in front across man's body to his left hand, while his right arm is behind her back. Both right hands clasped, and resting at her waist over hip bone. This position may also be reversed - Side Reverse (B) - with the man at the right of the lady, both hands clasped and resting at her waist over the left hip bone. Skaters positioned directly behind each other, skating identical edges. Hold can be either - both hands for both skaters - on the ladies' waist, or both skaters with one hand on the ladies' waist with the other one outstretched. Hand and arm positions are similar to those of the Closed (A) position, but the partners turn slightly so that both may skate in the same direction. The man's left hand and the ladies' right hand lead. This position may also be reversed, with the man on the ladies' right side. 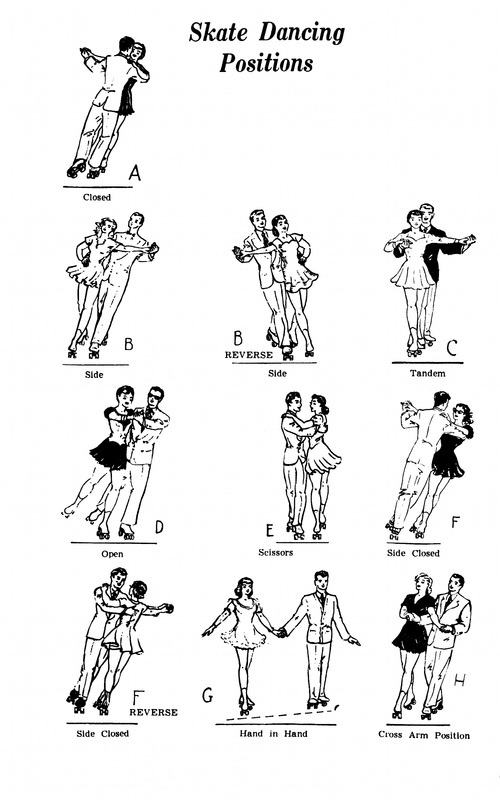 Same as the Foxtrot or Open (D) position, except that the clasped leading hands are reversed, following the couple rather than leading the couple. As in the Closed (A) position, one partner skates forward, while the other skates backwards. Unlike the Closed (A) position, partners skate hip to hip, the man either to the right or left (Reversed F position) of the lady. Same as the Killian position (B), except that the man's right hand, rather than being on the ladies' right hip, is placed in front of the lady and both partners clasp hands close to the ladies' torso.